When I was a preschool teacher, the spring unit was one of my favorites and I think it was one of my students’ favorites too. Seeds and flowers and baby animals are always lots of fun. 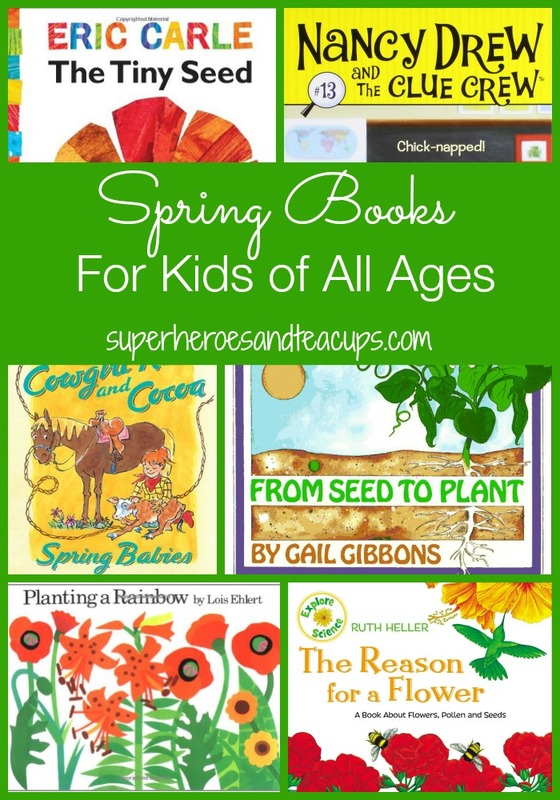 There are many spring books for kids, both picture books and chapter books. This is also a great opportunity to explore non-fiction books for kids. I hope you find something to share with your child! The wonderful Eric Carle shows children the life cycle of a seed in The Tiny Seed. In From Seed to Plant by Gail Gibbons, children can explore the relationship between seeds and the plants they produce. Children can learn even more about how seeds grow into plants in the classic Planting a Rainbow by Lois Ehlert. Ruth Heller helps children understand the relationship between plants and the creatures who rely on them in The Reason for a Flower. In It’s Spring by Susan Swan, readers can follow along as a young boy observes the arrival of spring. Beautiful photographs from National Geographic give children a true picture of spring in Everything Spring by Jill Esbaum. In And Then It’s Spring by Julie Fogliano, children can discover what happens when a young boy and his dog decide they’ve had enough of winter. The Cat in the Hat is back to explore flowering plants in Oh Say Can You Seed? : All About Flowering Plants by Bonnie Worth. Everyone’s favorite girl sleuth is back and readers can follow along as she figures why the class’ baby chicks disappeared in Chick-napped! (Nancy Drew and the Clue Crew) by Carolyn Keene. In Cowgirl Kate and Cocoa: Spring Babies by Erica Silverman, everyone’s favorite cowgirl and her talking horse learn about spring on the ranch. Henry and Mudge are back to enjoy spring weather in Henry and Mudge In Puddle Trouble by Cynthia Rylant. Fans of the Step Into Reading books will enjoy Spring Surprises by Anna Jane Hays. Children who are looking for a spring adventure will love Explore Spring! : 25 Great Ways to Learn About Spring by Lauri Berkenkamp. I love so many of these and we read them again and again. Thanks for the great list. Sharing! I love that book A Reason for Flower. We planted wild flowers this year. I think that is a perfect edition to our spring books!